Laura Sohn and Carlos Anderson gave their eastern Tennessee neighbors nothing to complain about when they, with the help of local firm Sanders Pace Architecture, constructed a modern cabin on their property. The land they bought, a twenty-minute drive from downtown Knoxville, is nestled in a copse of cedar trees, behind a swell, hardly visible from the road. In fact, the 2,500-square-foot house—a modern rendition of a dogtrot, spliced into a Y shape and clad in black metal—attracts far less attention than its nearest neighbor, an abandoned farmhouse said to date from the Civil War. Sohn, a sustainability consultant for a major music festival, and Anderson, an attorney-turned-nursing-student, went into the building process armed with little more than a wish list and an appreciation for idiosyncratic architecture. (Sohn’s grandparents designed a modern house in Oregon, in the 1970s, that informed her predilection for spare spaces and indoor-outdoor living.) The couple focused on a few specific asks—tall countertops, an outdoor shower, uncluttered space—and left the siting and material sourcing to Brandon Pace, principal at Sanders Pace Architecture. 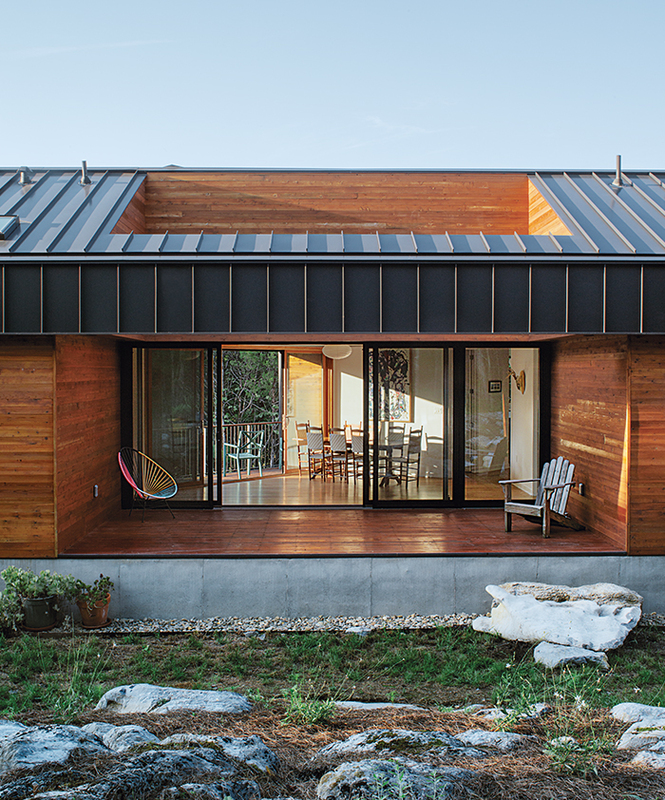 Brandon Pace, architect: The wood cladding is western red cedar, to go with the cedar trees all around the house. It’s a limited palette: wood, concrete, and metal panels, plus the glass windows. Laura Sohn, resident: You can’t see the house in the summertime, thanks to the trees—a lucky accident. I wanted to be outside of town. My jobs are pretty social, so I needed distance. This is one of the few properties that had enough acreage, and it was priced really well. Hiring an architect was always a prerequisite for us. We knew that we didn’t want a run-of-the-mill house. When I was growing up, my grandparents had a house that my grandpa helped design, and I always knew I wanted something modern and functional. The two houses don’t look the same, but [theirs is also] on a river, and it has some of the same pylon action. Pace: Building modern is about function—you can get what you want. Sohn: We used to live in a house that’s almost 100 years old, and we loved it—it just doesn’t function in the way that we do today. If you’re going to invest in a house, it should be exactly what you want. The in-between is not appealing to me. Pace: There’s something about hiring an architect and going to look at the site to understand what is good about it and how to take advantage. Pace: You gave us a list of eight bullet points, starting with connection between the spaces and to the outside. Sohn: That’s the whole point of living out here, being outside as much as possible. I also didn’t want to be looking at a wall when I was doing the dishes or cooking. We wanted windows but also privacy. And the outdoor shower was numero uno. Carlos Anderson, resident: The main thing for me was wanting it to be integrated into the environment. Besides that, clean lines and uncluttered space. Sohn: You start doing research and see all these supermodern things that look so cool. But when we started thinking about actually living in a space, we needed a balance between organic and modern. So we leaned toward Scandinavia rather than superslick American-style modern. Pace: It’s about appropriateness. Most of what we do as architects is “modern,” but we also do a lot of renovation work on old houses. Anderson: I’d seen a lot of Brandon’s work before, and I didn’t really know what he was going to come back with, but I knew it would be something good. Sohn: In terms of building green, the small stuff adds up: windows, insulation, and lighting. One thing I’ve learned from my time at Bonnaroo [Music and Arts Festival] is that if something doesn’t pay off in three to five years, it’s not necessarily the best investment. This house is 50 percent bigger than our old house, and our power bill is 30 percent of what it was! From winter to summer, our power bill stays about the same, with no spikes. Pace: We developed the program around [a public] Zone A and [a private] Zone B, then presented different options of how the layout could be adjusted according to the budget. I describe it like a funnel: You have a wide top and get more specific as you go. Sohn: At first, it was all these linear options, and then the architects said, “We could do a straight line, or we could give you a Y.” We could’ve gone straight, but it’s like, What’s the point if you’re not going to push it a little bit? Part of working with someone creative and smart is to come up with something you wouldn’t think of. Pace: The advantage of the Y shape is that you have exposures on all three volumes. It starts to kink along the existing contours of the landscape. Anderson: One of the reasons I liked the design is that it was something we hadn’t seen before. But, in the more detailed sketches, you could see how high up the house was, transposed with views of the trees onsite. That’s when I was convinced.